The Boren Effect: the frustrating phenomenon that occurs when one attempts to capture a clear photo with President Boren. It occurs most frequently at crowded events in which everyone pushes forward wanting a picture with Boren and the nervous photographer rushes through the delicate process of pressing the capture button on a phone camera, resulting in an unsatisfactory picture to remember the exciting three seconds with OU’s president. But at least I was able to shake his hand. All this aside, the BBQ was awesome. They had the biggest turnout this year with around 500 people in attendance. We were given a straw cowboy hat and a bandanna upon arrival, ate a classic BBQ dinner, and then tried out some country dances. There was even a mechanical bull! It was hilarious to watch the international students try to immerse themselves in Southern culture. In actuality, the event was also an opportunity for me to immerse myself in Southern culture, since I group up in suburban Arlington, Texas and was never really fully exposed to it. You probably would never have thought a Texan wouldn’t know how to two-step. But now I know, don’t worry. I’m learning more about my own culture than I thought I would by attending these international events that are meant to educate international students. On Wednesday, February 4th, I attended the luncheon talk given by Italian Ambassador Claudio Bisogniero. This event was held at the Fred Jones Jr. Art Museum, so in hindsight it does not seem unreasonable that I was asked to check my coat and backpack at the door. Nonetheless, I was surprised as I could not remember having checked a coat before and I certainly couldn’t remember ever having checked a backpack before! I walked down the hall, then followed a staircase to the underground gallery where the event was held. A scrumptious meal was served. After we had finished dining, Dean Grillot of the College of International Studies and President Boren of the University of Oklahoma each gave brief speeches introducing the Ambassador. The Ambassador then took his place at the podium at the front of the room and began to talk. He spoke mostly about Italy’s long history of friendly relations with the United States. Unfortunately, I could not stay for the whole of his speech. I had a Physical Mechanics class which I had to attend. Despite being slightly late for class, I would say that this was a very interesting and enjoyable event. It was very exciting to attend an event at which an Ambassador spoke! My last year in high school, I read a play titled Los Bicicletas Son para el Verano. The play is written entirely in Spanish, and I had a very hard time reading it. The story follows a middle-class family during the Spanish Civil War, and the youngest son in the family. At the beginning, the boy has a very simple request: a bicycle. However, as the play goes on, the family postpones the purchase of the bicycle, until ultimately, both the boy and the reader/viewer realize that the bicycle will probably never be purchased, much like how the boy’s childhood will never be regained. It’s a sad story, but a story that needs to be told. Many times, we forget that actual people were involved in and affected by the historical events that we study. I’m going to Spain this summer, as I’ve said in previous blog posts, and I still haven’t decided if I want to visit the Civil War memorials. Spanish people generally do not like talking about the war because it’s still so fresh, and its affects are still being felt today, and the people who frequent war monuments are typically elderly, and were sympathizers of Franco. One thing that really interests me is the impact that wars have on the middle and lower classes, especially considering that those in power and those with money are often those who write history. I want to learn more about the Spanish Civil War, but I’ll mostly be taking language classes while I’m there, so I’ll have to settle for reading more books about it, and trying to glean as much information about it as I can from my host family and other Spaniards that I come across. Instead of participating in OU Cousins, this semester I decided to try something new. I ended up tutoring kids from foreign nations at a local high school after school. I went several times a month, and helped kids with subjects from math to biology and everything in-between. I enjoyed helping these students, but I did have some troubles in the beginning. Though I realized that for many of these kids English was not their first language, I did not quite realize how much more patience and effort it would take to help these students understand crucial material in their non-native language. It was initially frustrating to try to explain math concepts and other related topics to students who I swear half of the time did not understand what I was saying. As someone with little patience, it did get annoying. After trying to explain to this one student for twenty minutes how to graph a line, I realized that though she might not understand what I was trying to tell her, she was doing much better than I would be in that situation. I am currently in Italian 1, and though I’m not doing terrible in the class, there’s no way I would be able to do math or biology in Italian, and I probably won’t be able to do that for many more years. Picturing myself in her shoes, trying to learn something new in a language I was not born into is incredibly hard and frustrating. Though I cannot say that I know exactly what she was going through, I imagine I will experience many similar situations when I go abroad (which is both exciting and extremely frightening). Surprisingly, the one thing I don’t want to give up when I go abroad is not my phone. I actually welcome the chance to spend less time staring at my phone, and more time taking in the world around me and socializing. The one thing I definitely do not want to give up when I go abroad, but know I will have to forego, is books. I love books. Big, thick, fat, heavy books. And unfortunately I know that attempting to fill my bag with multiple, space-vacuum books is unrealistic and would be a burden. I have always been an advocate for only reading printed books. There is something about the feel of holding a book in your hands, and turning the actual pages as you make your way closer to the end of the story that is personal and enhances the experience. I have never enjoyed staring at a screen for long periods of time as my eyes grow tired of peering into the bright light. However, I think I may have to convert to e-books in the interest of space and weight. When looking at the big picture, it’s not that important of a thing to give up. Maybe I will even learn to enjoy the convenience of e-books after my trip. I think that is one major part of studying abroad; learning to adapt and compromise the comforts of home that we are accustomed to. So for this month long trip over the summer, I will have to survive without physical books and become an e-book user. How hard could it be? 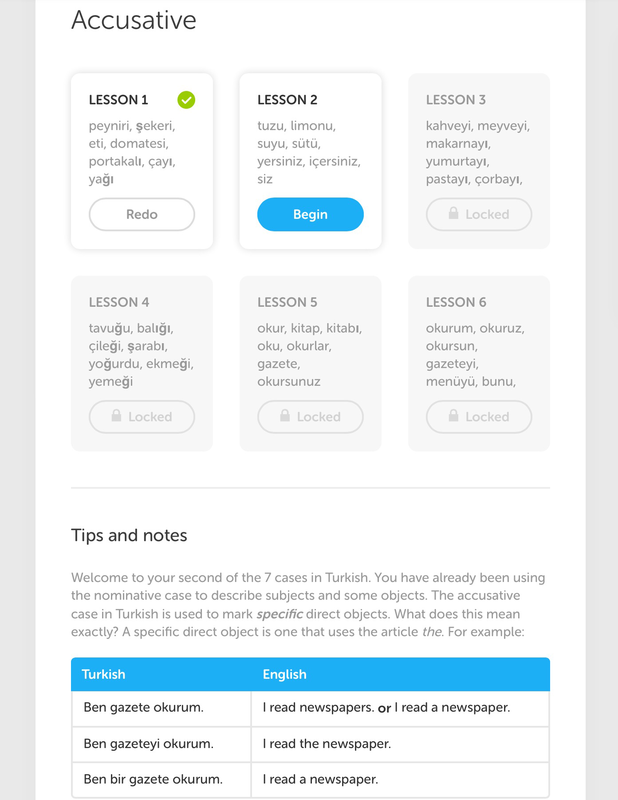 As part of my preparations to go on the Journey to Turkey this summer I have been learning some basic Turkish words and phrases. Unfortunately, Turkish is not as widely studied in the United States as some other languages like Spanish and German, which means that there aren’t as many free and reliable resources for learning. Now that’s changed, thanks to Duolingo! For those who don’t know, Duolingo is an entirely free language learning website that uses crowd sourcing to create their courses. However, unlike other sites like memrise where anyone can make a course, Duolingo has an application process and moderators so you know the course will be reliable and accurate. Other courses currently being worked on for English speakers include Hungarian, Polish, Romanian, Hebrew, Klingon, and Vietnamese. There are also tons of courses that have been made and are being made for speakers of languages other than English, such as Russian for Swedish speakers and Portuguese for German speakers. The courses are tons of fun to complete because of the gamified process that Duolingo follows, with points, lives, levels, and an on-site currency. And, as is obvious from the picture above, they are very thorough and provide lots of practice and notes so that the learner can easily grasp concepts. 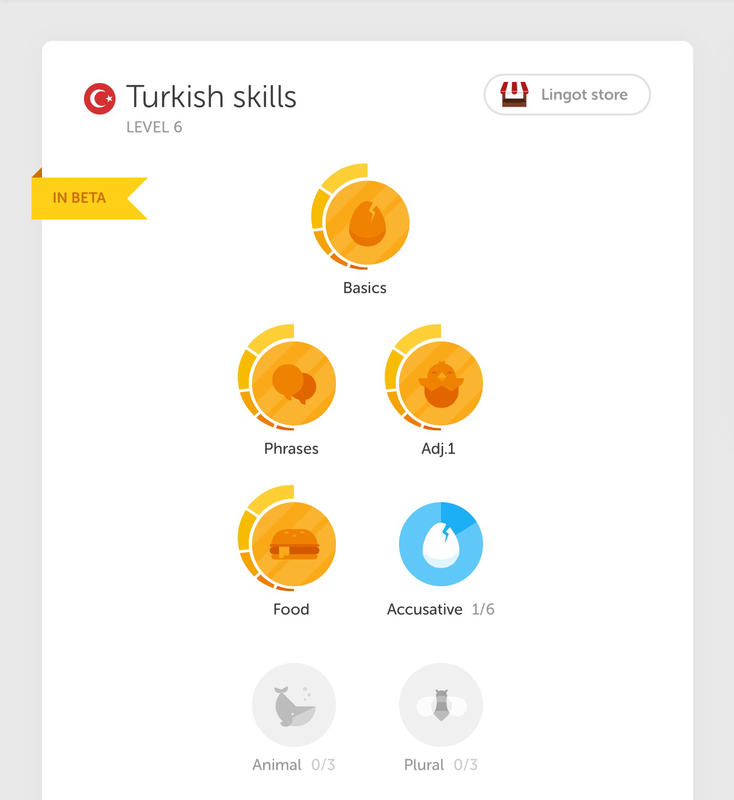 Overall, I am extremely excited to be using Duolingo to learn some Turkish before I leave to study abroad. I think having some knowledge of the language will really help to enhance my experience in Turkey, even if that knowledge is as basic as introducing myself and asking someone how they are. It will provide another level of connection in a foreign country that I am eager to explore. As my trip to Tanzania is quickly approaching, I have begun to have more and more doubts and fears about my ability to thrive in a foreign country. Last summer I travelled to Slovakia and I didn’t have any doubts or fears. However, in Slovakia, I was staying with my best friends family in a very Western culture. Tanzania is a totally unfamiliar culture to me; new food, new language, zero connections. I think that a lot of people might say that my fears and doubts are in fact justified. However, if anyone knows me well, they can say that these fears are uncharacteristic for me. I have always been the fierce warrior, venturing out in the world with my head held high and now that I have the chance to really see something new, I am afraid and I don’t know why. In light of these fears I have found that it is crucial to take a second and think about WHY I want to go in the first place. Instead of get anxious about my inability to communicate due to the language barrier, I need to focus on the opportunity I have in front of me to learn a new language. Instead of worrying about my Scandinavian inability to tolerate spicy foods, I should be looking forward to the funny stories I will get to share with my journey mates. My point is, even though there are one thousand reasons to be afraid to travel to Tanzania, there are one thousand and one reasons to be excited to go, and that is why I am going. After all, what is life without a bit of uncertainty or challenge? When I look back at my time spent abroad I hope my heart will be full of unforeseen memories, and by those I will know that I have lived. Kathy and I have been able to keep hanging out as the year has progressed, and I’ve really enjoyed getting to know her. Although we haven’t been able to go to many events, it’s nice to grab lunch every once in awhile. I’m really lucky that she’s staying at OU until she graduates, so we’ll get to keep seeing each other next year. Is it bad that one of the things I’m most excited for in going to Italy is the fact that I’m going to stuff my face with wonderful Italian dishes and simply pray I don’t gain 100 pounds in one semester? I always thought I should have been born into an Italian family with how much I love pasta and pizza and all that jazz. I know that’s nothing special, but the point stands. The great thing about Italy, too, is that there are all sorts of hole-in-the-wall cheap restaurants that offer pretty dang good food too. It’s almost more expensive to shop at grocery stores and make your own food than it is to go out to eat, which is completely reverse to what it’s like here in America. I would be more than happy to just hop from place to place in the city of Bologna and try everything I can; it sounds like an absolute dream. Then again, I also hope I can make a lot of Italian friends who know how to cook so they can teach me all of their tips and tricks. I could come back and dazzle my friends and family with my knowledge of Italian cuisine, and what girl doesn’t like a romantic candlelight Italian meal? Not one that I know of, no sir. Everyone secretly loves pounding down a plate of noodles and uncinching their belt a notch. I mean, culture and history is cool and all that, but carbohydrates? That’s my JAM! I’m sure a lot of GEF students went to Eve of Nations, so I’ll keep my thoughts short and to the point. For those didn’t attend/don’t know what it is, Eve of Nations is a night where the various international student groups on campus get together and put on song or dance numbers that show off a little bit of their culture. At the end of the show, a panel of judges from various different academic backgrounds chooses which group they thought did the best job, and it wins them magical powers from an ancient sorcerous tome (I wish). A dinner is also served that includes foods from across the world, such as Moroccan couscous and German cherry chocolate cake. Personally, I attended Eve of Nations Lite because I missed the first bus out to Lloyd Noble, and I also missed out on who won, but I can tell you who definitely should have: the Indian Student Association. They definitely had the best dance, and maybe I’m just partial to Bollywood music or something, but I really enjoyed watching it. A lot of the groups didn’t seem too polished other than the Indian group, though I suppose I should’ve seen that coming seeing as they’re not dancing clubs. A few of the other really cool ones were the Latin Dance Club and Tribal Village, although Tribal Village’s dance didn’t seem very traditional (although what do I know). One of the dances was kind of confusing: the Native American guest dance. There was a man and a woman, and while the man did dance around a lot, the woman simply walked slowly in a circle around him… I’m not sure whether or not that’s the whole point, but to me it looked kind of silly honestly. Regardless, it was fun to watch, as was the rest of the night; it’s something I would definitely attend again!